Participants were captivated during Equine Guelph's sold out pilot Groom Orientation Session, part of the new Industry Skills and Training Program held this past weekend at Sunrise Therapeutic Riding and Learning Centre. Through hands-on sessions with horses and facilities, demonstrations, presentations and discussions students were introduced to basic horse handling and management. The sessions outlined how to handle a horse in a safe and caring way, as well as, maintaining a healthy stable environment. The weekend began with a warm welcome by Gayle Ecker, Senior Manager, Equine Guelph and John Walzak, COO of the Ontario Harness Horse Association (OHHA), followed by a tour of Mohawk racetrack. This allowed the participants to get a bird’s eye view of life on the backstretch. The group then moved onto Sunrise Therapeutic Riding and Learning Centre where they eagerly jumped into the sessions. Participants also enjoyed a tour of Classy Lane Training Facility. It wasn't all work and no play for the soon-to-be grooms. 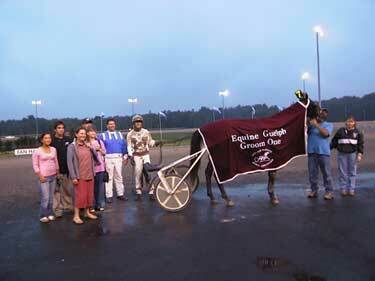 The group was thrilled by an exciting evening of Standardbred racing at Mohawk racetrack. The weekend ended with a informative panel discussion with; Philip Coole, Philip Coole Stables, Duane Marfisi, Duane Marfisi Stables, Doug Nash, Glengate Farm, Rick Rier, Ontario Racing Commission (ORC), Julia Samulak, Horsemen’s Benevolent and Protective Association of Ontario (HBPA), and John Walzak, OHHA. Following the two-day session, participants will be assisted in finding jobs within the industry. An online educational program will be launched as the second phase of this program which culminates with a skills test and a Certificate of Completion. The expected duration of the online portion and accompanying job training is 6 months. "This program is very much an industry driven initiative." says Gayle Ecker, Senior Manager, Equine Guelph. "The goal is to educate and train participants to be competent, employable grooms at either a racetrack or training facility and is ideal for people who have an interest in horses but lack experience in the racing industry." Instructors and presenters included Suzy Bender, Sunrise Therapeutic Riding and Learning Centre, Duane Marfisi and Boyd Wilson, Duane Marfisi Stables, Doug Nash, Glengate Farm, Rick Rier, ORC, Julia Samulak, HBPA, Ben Wallace, Ben Wallace Stables, and John Walzak, OHHA. University of Guelph instructors included Gayle Ecker and Susan Raymond, Equine Guelph and Melanie Prosser, Open Learning. Generous support was also received from Purina Agribrands and ShowOne. For more information, or if you are looking for employees as grooms or caretakers, contact Gayle Ecker, Equine Guelph (519-824-4120, ext. 56678) or John Walzak, OHHA and Chair, Equine Guelph Education Committee (905-858-5854).